Not to be confused with Royal Viking Line or Viking Line. Viking Cruises is a cruise line providing river and ocean cruises, with operations based in Basel, Switzerland. It has two divisions, Viking River Cruises and Viking Ocean Cruises. As of July 2018, it operates a fleet of 62 river vessels and 6 ocean ships, offering cruises along the rivers and oceans of North and South America, the Caribbean, Europe, Russia, Egypt, China and Southeast Asia. The company was established by Torstein Hagen in St. Petersburg as Viking River Cruises in 1997. Hagen had become involved in cruising as a McKinsey and Co. consultant who helped the Holland America Line survive the 1973 oil crisis, then was briefly CEO of Royal Viking Line in the early 1980s, made money in the Russian private equity markets, then bought a controlling stake in a Dutch shipping company that failed in the mid-1990s, leaving him almost bankrupt. Around that time he helped some Russian oligarchs buy a shipping company, and in exchange they sold him four river cruise ships cheaply, which were the founding fleet of Viking. In 2000, Viking purchased KD River Cruises of Europe, which brought Viking's fleet total to 26, making it the largest river cruising fleet in the world. The company revamped the ships, aiming for its target demographic of older North Americans who wanted to see the world simply; the lack of frills like gyms and pools, and the standardization, also maximized the number of people the ships could accommodate and Viking's profit. The company also partnered that year with sales agents in the UK, and the US, and opened its own sales office in California. It hired its first marketing firm the next year, focusing on North America. The company expanded into China in 2004 with Yangtze River cruises. By 2007 it was operating 23 ships in Europe, Russia, and China. In 2009, Viking started to use ships with hybrid diesel-electric engines that the company said use an estimated 20% less fuel than conventional engines. In 2011 the company planned a new phase of growth, starting to sponsor Public Broadcasting System's Masterpiece Theatre, and making plans to add 40 ships of a new "longship" design to its fleet over a five-year period. The longship design maximized passenger capacity by squaring the bow and rearranging hallways. It christened 10 ships in one day in 2013, and the 16 ships it christened over two days in 2014 were Guinness Book of World Records. By 2013 the company had spent around $400 million in marketing through direct mailing, television, the web, and trade marketing. In May 2013, the company modified its name to Viking Cruises as it announced the launch of Viking Ocean Cruises, a division of small, oceangoing vessels. By 2017 the company's operations center was in Basel, Switzerland, and its marketing headquarters were in Los Angeles, California. Viking River Cruises offers cruising along the rivers of Europe, Russia, China, Southeast Asia and Egypt. Viking's European ships have a typical capacity of 190 passengers; its Russian ships' capacity averages just over 200 and its China ship carries up to 256. As of 2017 Viking River Cruises operated a fleet of 62 vessels. In 2013, Viking announced its ocean cruise division, Viking Ocean Cruises, the first new cruise line in nearly a decade. 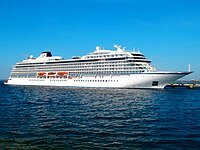 Viking's ocean cruise division began operating its first vessel, Viking Star, in 2015, with itineraries in Scandinavia, the British Isles, the Baltic and Mediterranean Sea. It was joined by the fleet's second vessel, Viking Sea, in 2016; and its third and fourth ships, Viking Sky and Viking Sun, in 2017. Viking's fifth ocean vessel, Viking Orion, was christened in June 2018. Being one-third the size of many cruise ships being built by major cruise lines, this allows the Viking Star-class to enter into smaller ports. Its overall length is 745.4 ft. (227.2 m); its beam is 94.5 ft. (28.8 m); the draft is 20.7 ft. (6.3 m); with a gross tonnage of 47,800 GT. The four ships were built by Fincantieri shipyard in Ancona, Italy, and the Scandinavian influenced, modernist interior design was developed by London-based SMC Design and Los Angeles–based Rottet Studio. Viking's itineraries feature travel in Northern Europe, the Baltic, the Americas, the Caribbean, the Mediterranean, Asia, Australia and New Zealand. Their ships spend more time in port than is common at other ocean lines, emphasizing a focus on the culture of their destinations. Viking Ocean Cruises' vessels carry up to 930 passengers and 550 crew. In December 2017, Viking launched its first round-the-world cruise, which departed from Miami, and sailed south to head through the Panama Canal, and planned to visit five continents, 35 countries and 64 ports before ending its 141-day journey in London. In April 2018, the company announced it had ordered two "special" cruise ships from VARD that are expected to enter service in 2021 and 2022. Viking Cruise Line debuted their newest ocean ship, Viking Orion, in Livorno, Italy in June 2018. It holds 930 passengers, and the ship's godmother is former NASA astronaut Anna Fisher. The ship's name is partially inspired by the Orion space exploration vehicle and the ship has its own onboard planetarium. In May 2018, Viking Cruises announced its intention to launch a new package called Ultimate World Cruise, which it claimed to be the longest continuous world cruise itinerary in history. Its most expensive package will cover 245 days on Viking Sun and will stop at 59 countries and 113 ports. Since 2011, Viking has sponsored programming on PBS's Masterpiece Theatre, including Downton Abbey, Sherlock and Poldark, and is a sponsor of National Geographic's Genius, a scripted series about the life of Albert Einstein. Viking has also sponsored the Los Angeles Philharmonic at The Hollywood Bowl, Metropolitan Opera, BBC, Munch Museum in Oslo, Norway, and Mariinsky Theatre in St. Petersburg, Russia. On 23 March 2019, Viking Sky put out a mayday call after she suffered an engine failure off the coast of Norway. Six of Norway’s fourteen rescue helicopters were sent to the scene, and 460 passengers were evacuated before the ship travelled to Molde under her own power. The vessel was attached to a tugboat as the anchors were inoperable. On 27 March, Viking Sky arrived at a shipyard in Kristiansund for repairs. The next scheduled cruise was cancelled. ^ a b c d e f g h Allan E. Jordan, "Viking Cruises goes from upstart to leader in 20 years," Cruise Business Review, February 2017, pp. 36-39. ^ a b c d e Adam H. Graham, "The Rising Tide: How Viking Changed Cruising," Departures, November 21, 2016. ^ a b c Rosemary McClure, "Viking plans to add 10 new river and ocean-going cruise ships," Los Angeles Times, October 31, 2017. ^ a b c Weissmann, Arnie (April 2, 2013). "Rolling on the rivers". Travel Weekly. ^ "Viking River Cruises". Sealetter Cruise News. Retrieved 19 December 2017. ^ "A Viking Ship to Launch with a Green Accent," The Avid Cruiser, May 29, 2009. ^ a b Elaine Glusac, "Interest in European River Cruises Soars," New York Times, June 29, 2012. ^ a b Tom Stieghorst, "Viking Cruises' Torstein Hagen," Travel Weekly, October 25, 2016. ^ "Viking Longship Series, Viking River Cruises," Ship-Technology.com, March 2011. ^ "Six new river ships in a day? Rapid Viking expansion continues," USA Today, March 1, 2016. ^ a b Gene Sloan, "Viking River Cruises to add seven new ships in 2019," USA Today, October 26, 2017. ^ "Viking Cruises Will Begin Ocean Cruises on Viking Star in 2015," Los Angeles Times, May 17, 2013. ^ Fran Golden, "Perfect Examples," Porthole Cruise Magazine, August 21, 2017. ^ Veronica Stoddart, "6 River Cruises to Take in 2017," Conde Nast Traveler, March 31, 2017. ^ "Viking River Cruises Viking Emerald Cruises," Travel Weekly. Accessed November 30, 2017. ^ "Viking Reveals Details of New Ocean Cruise Line," Cruise Critic, May 17, 2013. ^ a b c Christian L. Wright, "Cruise Vacations for the Anti-Cruise Crowd," Wall Street Journal, April 4, 2017. ^ a b Gene Sloan, "Fast-growing Viking Ocean Cruises orders two more ships," USA Today, April 18, 2017. ^ Gene Sloan, "Construction begins on a sixth ship for Viking Ocean Cruises," USA Today, October 20, 2017. ^ "First look: Inside Viking Cruises' newest ocean ship, Viking Orion". USA TODAY. Retrieved 2018-06-26. ^ Gene Sloan, "First Look: Inside the Year’s Hottest New Cruise Ship," USA Today, April 13, 2015. ^ a b "Viking Star Cruise Ship, Italy," Ship-Technology.com. Accessed December 19, 2017. ^ "Living Large: Inside New Viking Ship's Stylish Suites," USA Today, April 17, 2015. ^ Kennedy, Sherry (December 16, 2017). "Viking Sun Around the World 2018 Voyage Just Began from Miami". Cruise Maven. ^ "The round-the-world cruise that will cost you £31,000". Mail Online. Retrieved 2018-03-09. ^ Staff, CIN (2018-04-04). "Viking Orders Two 'Special' Vessels from VARD". Retrieved 2018-04-05. ^ "Astronaut christens new Viking Cruises ship, Viking Orion, in elaborate ceremony". USA TODAY. Retrieved 2018-06-26. ^ Wood, Donald (4 May 2018). "Viking Announces Longest Continuous World Cruise". TravelPulse. Retrieved 18 October 2018. ^ Sloan, Gene (2018-05-02). "A world cruise that lasts 245 days? That's the plan at Viking". USA TODAY. Retrieved 2018-08-17. ^ a b "More 'Downton Abbey' from Viking Cruises," Travel Pulse, November 21, 2017. ^ "Viking Cruises, National Geographic Launch 'Genius' Series," Travel Agent Central, April 21, 2017. 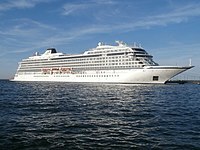 Wikimedia Commons has media related to Viking Cruises. Years indicate year of entry into service with Viking Cruises. This page was last edited on 18 April 2019, at 22:15 (UTC).